Why the Dream Job Isn’t Always the Dream — Spruce Rd. 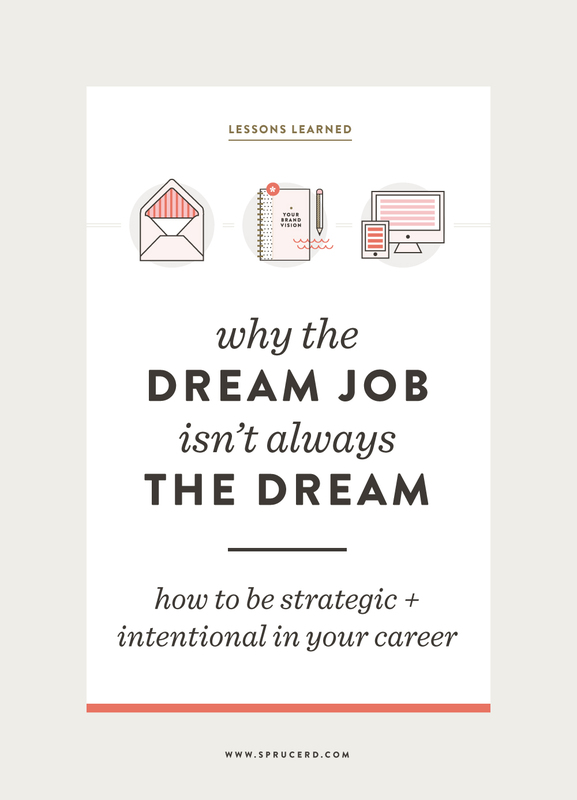 Why the Dream Job Isn't Always the Dream | How to be strategic + intentional in your career - Spruce Rd. It was that first year out of college, 2010 (gasp… has it been that long?!?). The economy was pretty shot, but slowly inching itself out of the slump. I was recently married, and my husband and I decided to just go for it and move to Austin, and hopefully find jobs quickly! I applied to numerous graphic design studios, whether they were hiring or not, and had a handful of interviews. That first year is a very tough, yet defining year for new graduates. I was determined to get a graphic design job, and gave myself a deadline before I would lower my expectations to just taking a job anywhere. I was very blessed to get a job as a graphic designer working full-time at a church I adored in Austin. I am so grateful God placed me there with such amazing + supportive work friends, where I was able to hone my craft as a designer. Was it the job I dreamed of, right out of college? No. However, it did allow me to get experience working in the graphic design industry. I was content with my church graphic designer position, and felt creatively challenged while I was there. I wasn’t actively seeking another job, however I always did have my eye out for a position at my dream company: Fossil. Fossil is a clothing, watches + accessories store with immaculate color palettes, and quality materials + designs. If you aren’t familiar with their graphic design work, run to pinterest right now and have a look! You can also check out Dustin Wallace and Brent Couchman who were designers/illustrators for Fossil. I always kept an eye out for an open position because they are based in Dallas, which is where I am from, and their design aesthetic resonated with me: modern vintage. I always was drawn to working as an in-house designer for a brand that I could get behind. I digress. As I was over a year into my job at the church, I saw a posting for a position I felt qualified for and applied just for the heck of it. Fossil employs people from all over, so I knew competition would be pretty stiff. Somehow, I made it through and they actually interviewed me for two positions, in different departments! I felt like such a fangirl walking through their newly renovated office that was HUGE, sunlit and so well styled. As I walked to one of the conference rooms, I passed a few photo-shoots, and felt like a little girl at an amusement park… excited beyond belief. Was I really here? I had such great interviews for both positions, and was pretty amped about the whole experience. At this point, you are probably thinking what I was at the time — of course I would jump at the opportunity if they asked to have me on board! Surprisingly, we would both be wrong. I was back in Austin, and eagerly waiting for the phone call to see if I got offered a job. Prior to this, my husband and I had the whole 3.5 hour trip back to Austin to weigh the pros + cons of the job at Fossil. The job I interviewed for would essentially be a stepping stone, to propel me forward within the Fossil brand. If I accepted, I would be designing web banners for Fossil as well as placing them on various sites. The job sounded so awful to me, but I knew that I could most likely move up after putting in some time at the low-level position. I contrasted this job, with my current one at the church where I had complete creative freedom + trust. I wasn’t solely doing production work, I was designing logos, t-shirts, publications, event banners and sermon graphics. I loved the variety of work, and design aesthetics for each branch of the church: women, children, missions, etc. I later received the phone call, and they offered me a job with great pay and benefits, including 50% off their items! After giving it a lot of thought, I turned down the job offer at Fossil. I realized that the dream job, just isn’t always the dream. Prior to this decision, I had to take a step back and evaluate what my long term goals were, and ultimately decided that within the next 5 years I wanted to start my own business (yay, I did it!). If I worked at Fossil, trying to move up the ladder, I would not have had the best preparation for starting my studio. I wanted to work in an environment where I felt both creatively challenged, as well as constantly learning. This set me on the path to be very particular about the jobs I accepted, as well as many other “dream jobs” that I actually turned down. When you have a direction in mind for your career, you have to be strategic in the jobs you accept. After I worked at the church, my husband got a job that required us to move so I had to find another job. I ended up at a university, where I was able to really stretch myself in client interaction, and learned SO much about print design. Following the university, my husband went back to school to pursue a graduate degree so we had to move yet again! I learned so much at the university, but it was a great time for me to transition as I felt maxed out in my growth there. Quickly, I found a job at a local design studio where I could work from home and what I thought would be more of a direction I wanted to go. I only worked there for about a half-year, as unfortunately I felt uncomfortable with some of the business practices. I won’t go into detail, but if you ever find yourself compromising your integrity for your employer, get the heck out. Yes, this might look bad to work such a short time, but I don’t regret it for a second. My initial goal to launch Spruce Rd. was the beginning of 2016: You know when my husband would have graduated, I would have been able to transition a bit smoother, and everything was perfect. But you know what? Life doesn’t always work out that way, and I am okay with that. I am so thrilled I launched a year earlier than my goal, and felt equipped to do so through my experiences over the past 4.5 years in the design profession. To all of those recently graduated, or about to graduate, designers out there! I know it is May, and some of you are about to start the process of applying for jobs. My advice to you is to understand what you are passionate about, and pursue that first. The *dream job* to most designers seems to be at a trendy design studio. At one point, I considered this route as well, however acknowledged that it wasn’t the best fit for me. I have a pretty firm work/life balance and as a newly wed I wasn’t ready to give that up! Call it lazy if you want, I call it self-awareness. I didn’t want to be up endless hours at a design studio, getting burnt out. Find out what you are passionate about, and align that with your goals. Do you love working within a certain design aesthetic only? Try finding an in-house design job that has a similar aesthetic. If you can’t find one right off the bat, find an in-house job somewhere else and put in the time there to become familiar with branding from that perspective. After you have a bit of experience, try to transition to a job that is a better fit aesthetically. If you want to eventually freelance on your own, try getting jobs that push you creatively, as well as opportunities that allow you one-on-one interaction with clients. Test the waters and see how you like dealing with clients, before making that leap! Sometimes, we don’t get our dream job in the early years of our careers. It is the journey that helps us to get there, and prepares us for that next step. I wrote this post to not be discouraging, but to shed light on being strategic in your career. I think so many new graduates miss this aspect of getting a job. Don’t rush it if you don’t have to, and instead embrace the chance to evaluate what your goals are, and set milestones to help get you there! Have you had a similar realization when you applied for jobs? Are you searching for jobs right now, that align with your long-term goals? I would LOVE to hear your stories in the comments below! Let’s get to know each other.